For the past nine months BSc Sociology student Paisley Allan has been volunteering with a charity mentoring children from difficult backgrounds – a “most rewarding experience” and something she wouldn’t have thought about if she wasn’t at LSBU. “I found out about this charity through a workshop that was organised by one of my lecturers. Paisley joined the Sociology course through Clearing after she missed the entry requirements for the LSBU course – Psychology (Child Development). She says it was thanks to a supportive Clearing adviser that she secured a spot on BSc Sociology. “LSBU has always been my first choice and this is because it's always given me the feeling that everyone is welcome, everyone is accepted - a university with open arms. LSBU was great - supportive, informative, positive. 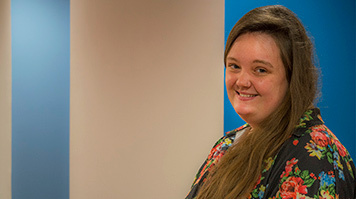 LSBU also considered Paisley's previous work experience with autistic children and her time spent volunteering, which helped with her application. Paisley says university has allowed her to grow into the confident, happy person that she is today. She has been Treasurer of the University's student Dance Society, has won the University Crest for her contribution to organising the netball team and a gold award for her work as a Students' Union course rep. She is also a student, sports and halls ambassador. She is now thinking of taking a year out after graduating before doing a PGCE to go into teaching. "In the beginning I had chosen LSBU because it had the course I wanted to do. But LSBU also reached out to me. I felt accepted and knew that this was the university I wanted to go to. LSBU is very multicultural and I love being in an environment where I can mix with different people. "There is lots of support out there and people will help you along the way. I love LSBU and I'm glad I came here."